Six servicemen carry the remains of Army Cpl. Robert Graham from a plane at San Francisco International Airport on Wednesday, April 6, 2016. Orval Young walks toward what remains of his property as a truck burns behind him in Middletown, California, on Sunday, Sept. 13, 2015. C.J. Maes (top) and Jim Fusscas of the National Park Service inspect cliff face erosion in San Francisco, California, on Wednesday, Feb. 17, 2016. 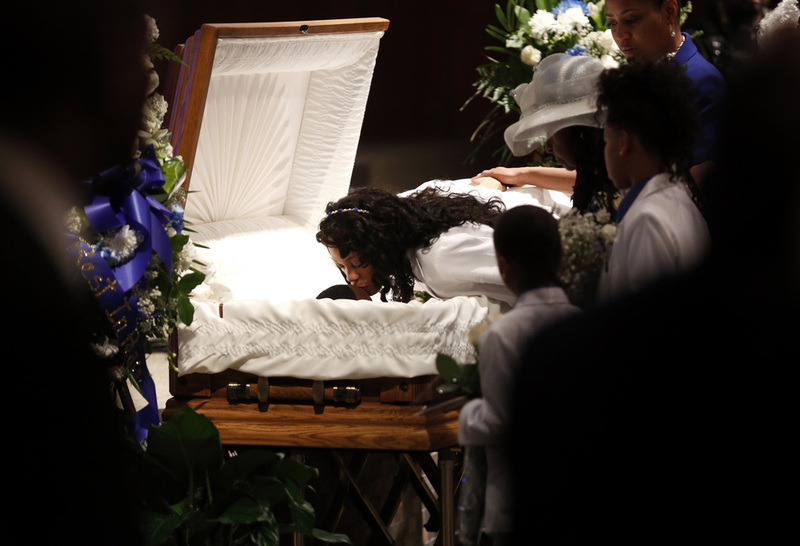 Audrey Hughes Cornish kisses her son Torian Hughes during his funeral at Shiloh Church in Oakland, California, on Monday, Jan. 11, 2016. Dean shows off his tattoos — including Nazi SS bolts from his time in a California biker gang — while in his new apartment in Salem, Oregon, on Friday, Dec. 7, 2018. A police officer tosses a flash bang grenade toward a suspect during a standoff in San Francisco, California, on Wednesday, July 6, 2016. President Barack Obama and his Secret Service detail walk from Air Force One after landing at San Francisco International Airport on Friday, June 19, 2015. 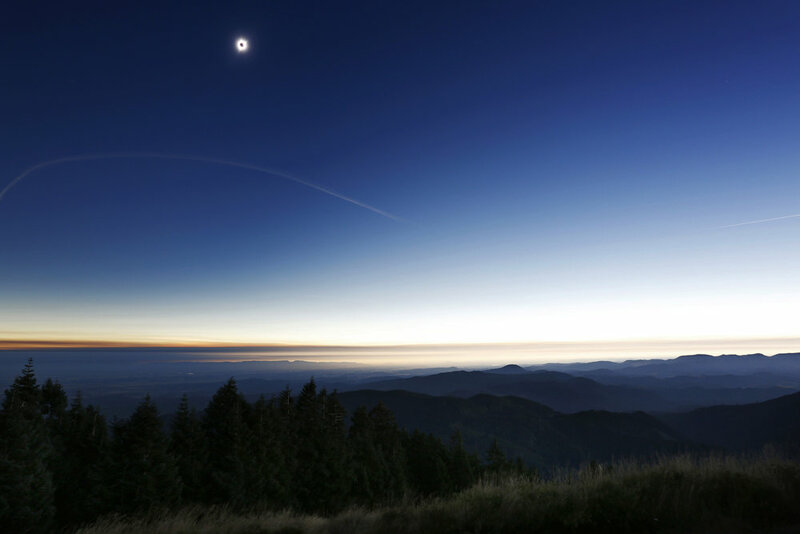 The total solar eclipse reaches totality over a landscape scene from the top of Marys Peak in the Siuslaw National Forest on Monday, Aug. 21, 2017. Leslie Levy uses a pair of binoculars to spot birds at sunrise while in a kayak on San Leandro Bay in Oakland, California, on Sunday, Dec. 20, 2015. The San Francisco Mime Troupe performs the musical "Schooled" at Dolores Park in San Francisco, California, on Monday, July 4, 2016. Lawrence LaBianca repels above a new Alexander Calder mobile at the Museum of Modern Art in San Francisco, California, on Tuesday, April 5, 2016. Ian McClelland lifts the anchor of a sailboat racing mark to throw in the waters of Clipper Cove off Treasure Island, California, on Thursday, May 5, 2016. Silvio Maniscalco talks to his daughter on the phone outside Gino & Carlo where he works as a bartender in San Francisco, California, on Thursday, Aug. 13, 2015. Giants Pitcher Matt Cain hits a ball toward targets while competing against LPGA golfers at AT&T Park in San Francisco, California, on Monday, May 23, 2016. Two Menlo College baseball players take batting practice after a home game in Atherton, California, on Wednesday, March 30, 2016. 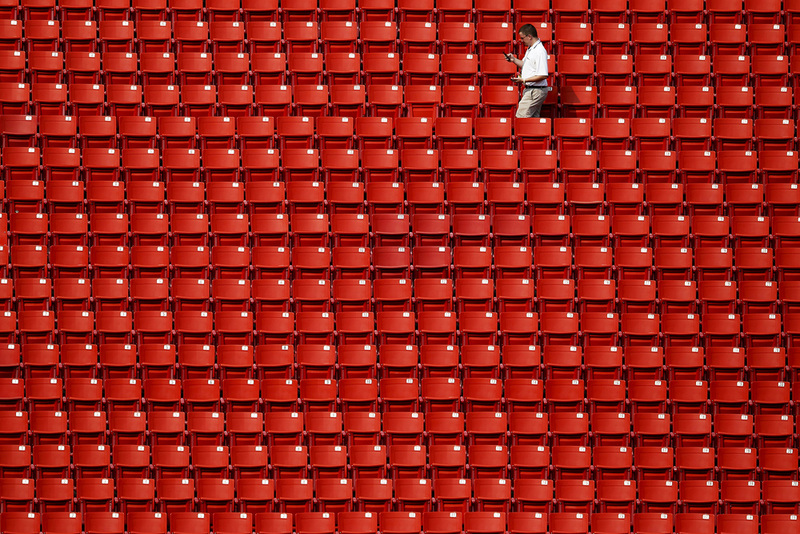 A Washington Redskins employee walks through the stands before a preseason game against the New England Patriots at FedExField on Thursday, Aug. 7, 2014. Daniel Connolly (center) lines up a shot during the San Francisco City Golf Championship at Harding Park in San Francisco, California, on Sunday, March 13, 2016. Jim Rogers aims at a target balloon during a competition at Ben Avery Shooting Range in Phoenix, Arizona, on Thursday, Feb. 27, 2014. Quinton Patton (11) and Jerraud Powers (25) dive for a pass during a game between the 49ers and the Arizona Cardinals at Levi's Stadium on Sunday, Nov. 29, 2015. Terri Twatwaffle gets ready backstage before "The Queens of 2015" drag show at Balancoire in San Francisco, California, on Thursday, Dec. 10, 2015.